The Sky is Falling Chicken Little! 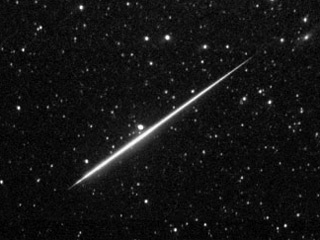 Not many people are fortunate enough to ever see a meteor fall from the sky. I have actually seen two in the past couple of months! One was on March 24 at about 8:00 pm. This one was reported by our local news station. The second one was the evening of May 11 on our way home from Grand Rapids. Scott, the boys, & I all saw that one. This picture is kind of what it looked like, but this isn't a picture of either actual sighting. The news station said there was a meteor shower to the south of Grand Rapids, which is where we were at the time.